December | 2013 | Love Those "Hands at Home"
Warmth, Any Way I Can Get It! The weather outside, in upstate New York, is truly frightful. The temperature, right now, is 15 degrees Fahrenheit (that’s minus 9 Celsius) and that’s the warmest we will see for days. On Friday, the high is expected to be 0 F or minus 18 C. I can’t even bring myself to think about what the wind chills will be! 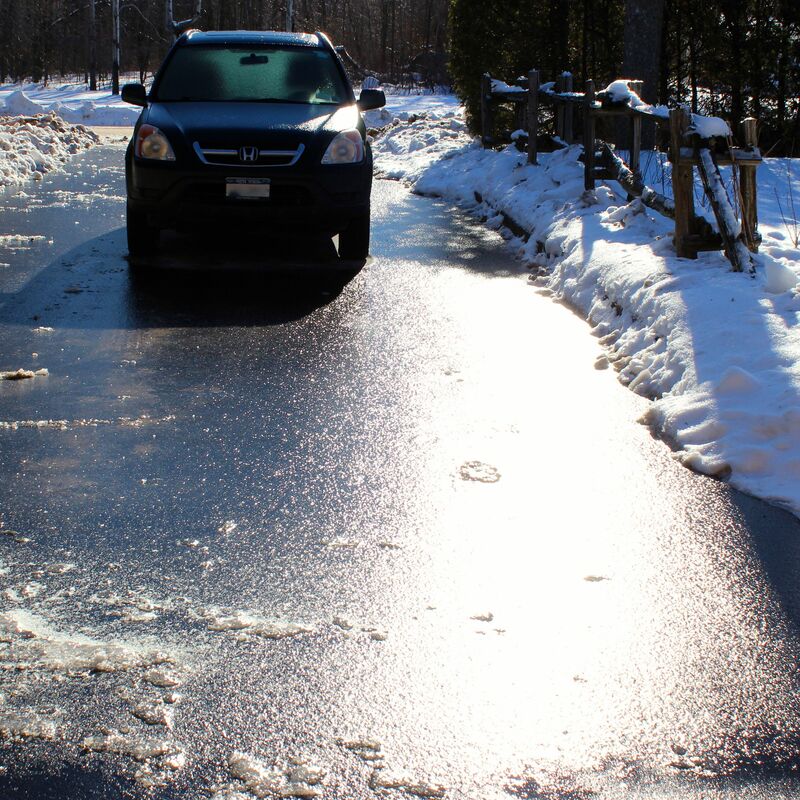 This is our driveway, AKA the rink. That’s ice and it’s not going to go away. But I found a way to combat the cold! No, not hot toddies and buttered rum—it’s not noon yet and even I can’t hit the hard stuff this early! 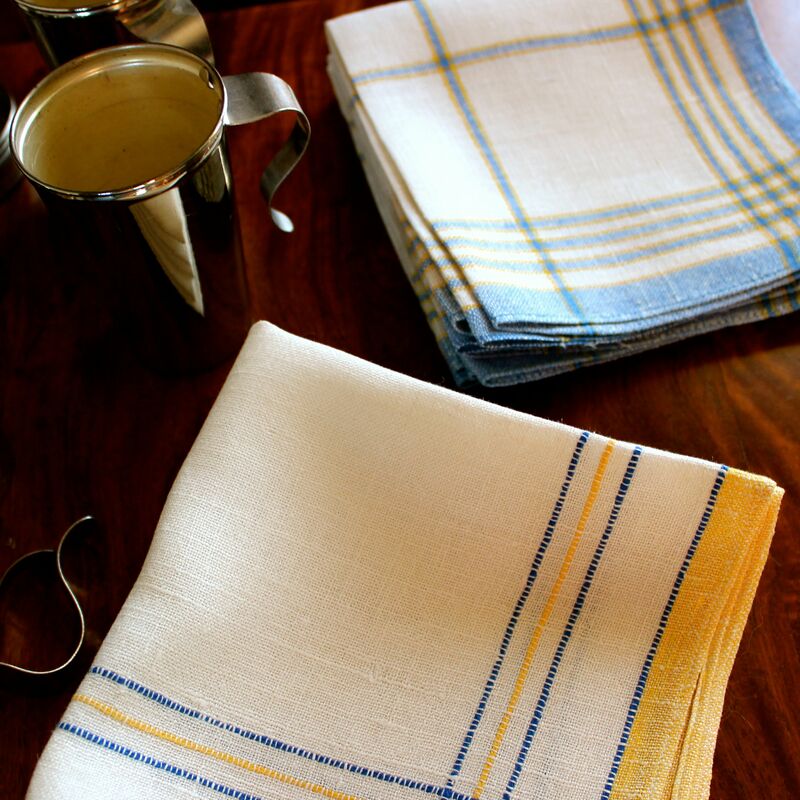 I finally decided to get back to washing and ironing some of my beloved vintage linens—it’s been months since I focused on them and I haven’t listed new ones on Etsy in a very long time. I figured ironing would help keep me warm. So I put on some music and reached for the items on the top of the pile. And serendipity kicked in. The music was Jimmy Buffett and the linens at the top were napkins that scream PICNIC! Then I found a set of vintage nesting camp cups that completed the scene. So, I’ve been having a lovely little beachy interlude. 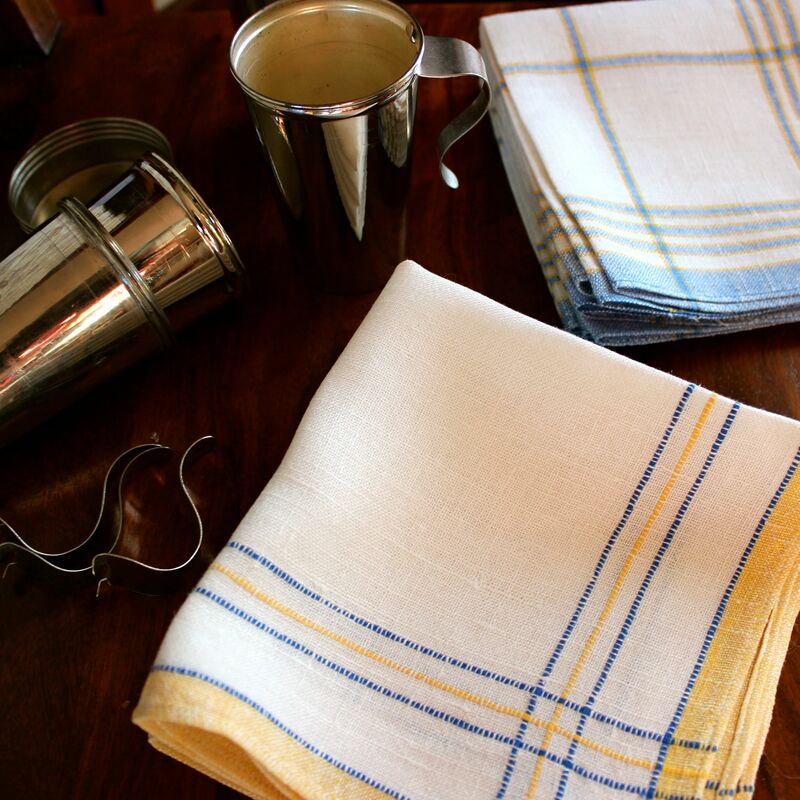 The steam’s rising off the iron, Jimmy is singing about Margaritaville, and these linens, with their fresh colors and stripes, help me believe that it’s possible to be warm in spirit, even as Mother Nature pitches us into the deep freeze. And to believe that the weather will warm up, eventually. This should hold me over until it’s a legitimate time for a hot adult beverage! Maybe I’ll put it in one of those nesting cups, sit in front of the fireplace and pretend it’s a campfire at the beach! If you’re in the Northern Hemisphere, I hope you’re staying warm! I’ve been saving this for you! For this very moment, when, after the round of holiday parties and dozens of the same old snacks, you need something new and different and yummy to take to that New Year’s Eve get-together or Super Bowl party. This recipe for a savory cheesecake spread is incredibly easy, really tasty, and unusual enough to cement your reputation as a great and imaginative cook. What you need before you start, though, is a small springform pan. I love using a springform pan because it makes me feel like a real cook. While it’s easy enough to find a standard-size pan of about 12 inches, you may need to shop on-line to find a 6-inch pan. And you need some sort of savory jelly or jam. I got the recipe for this cheesecake from a woman who made garlic jelly—it sounds kind of gross but it was wonderful and the resulting cheesecake was spectacular. She sold the jelly with the springform pan and included the recipe—a kit for perfection! People don’t usually say that about the things I cook so I knew I had a winner! 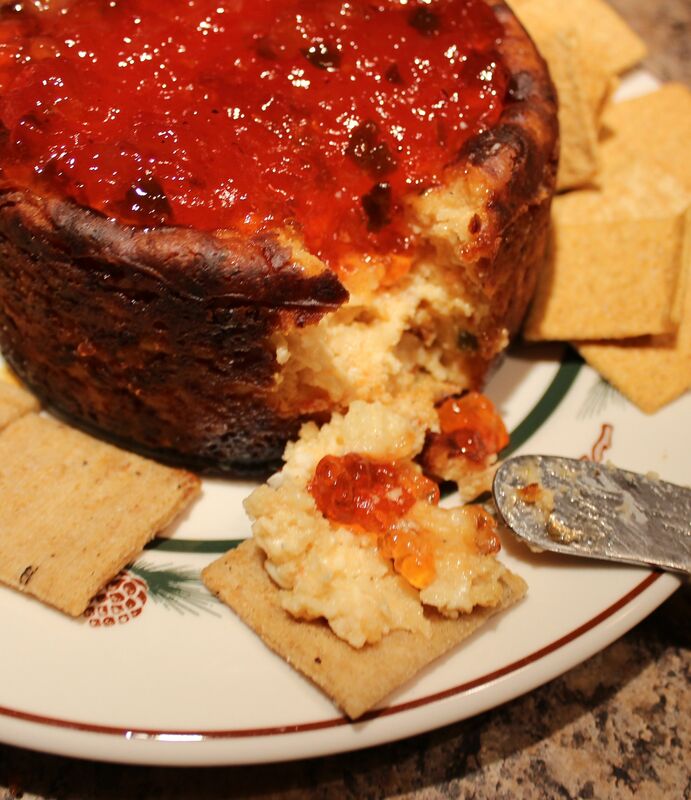 Since I made that first cheesecake and used up the garlic jelly, I’ve made the cheesecake with garlic jam made by Stonewall Kitchen, as well as hot pepper jellies that are much easier to find. 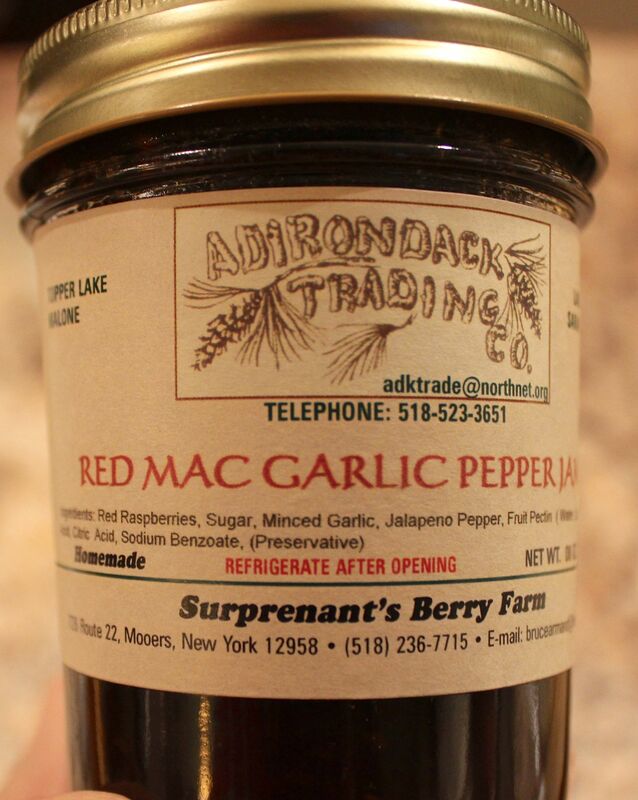 All of these are equally grand or you might find a jelly that has hot peppers AND garlic! Mix first five ingredients together with half of the jelly. Pour mixture into greased 6-inch spring form pan; I also cut a circle of cook’s parchment paper to line the bottom of the pan and placed the whole thing on parchment on a cookie sheet. I love using parchment paper because it makes me feel . . . well, you know. Bake at 375 degrees for 40-45 minutes. It’ll get quite brown and be just a little jiggly in the middle. When you take it out of the oven, the top will be puffed up and will slowly sink, to make a perfect little bowl for the remaining jelly. Cool completely. Remove the outside of the pan. Top with remaining jelly. Serve with crackers. Wait for people to ask for the recipe. 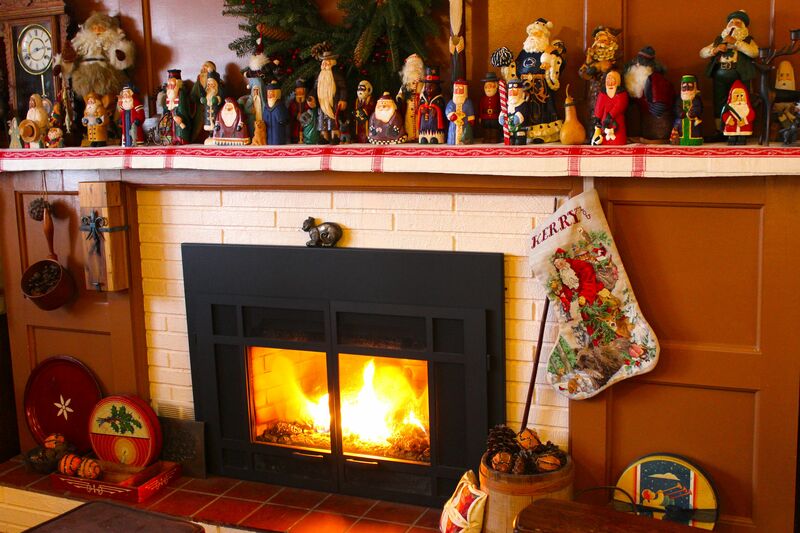 Here’s to a perfect day of enjoying memories of Christmases past and of making new memories! I’ve said it before and I’m sure to say it again. And I especially love this Santa. It pains me that this Santa comes out only for a few weeks a year. My husband, the cross stitcher, made this Christmas stocking for me—possibly the most perfect example of loving hands at home! At the time he made it, we lived in a big city and had a summer “camp” in upstate New York. We loved the rustic spot but only lived there for a couple months in the summer. 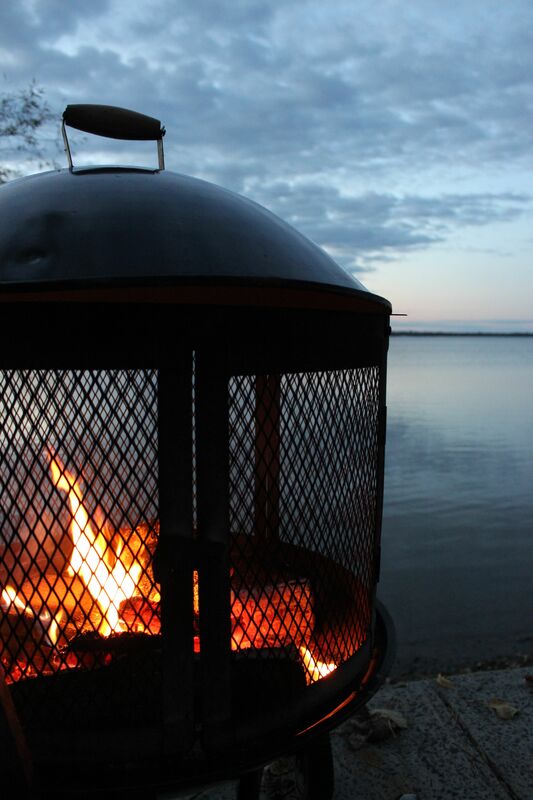 We worked in the city and yearned for the country and the Adirondacks and Lake Champlain. 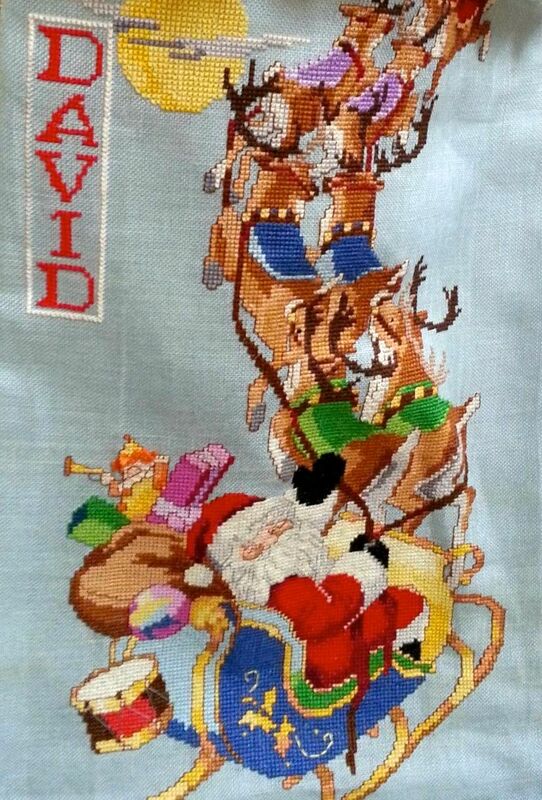 So he chose a cross-stitch pattern for my stocking that would bring the rustic to our city Christmas. And being the kind of guy he is, he kept track of every minute he spent on stitching the very dense, detailed pattern. It took him . . . wait for it . . . 246 hours and 20 minutes! He also spent time figuring out about how much he made per hour, as a college prof and business consultant, and let me know how much the stocking was worth, if he had been paid that hourly wage to make it. It was a big number, reflecting big love. He gave me the stocking 10 years ago today! Of course, I knew it was coming—he could never have worked so long on it without me knowing. But to see it all done, in its glory . . . well, every year when I take it out of storage, I’m amazed all over again! 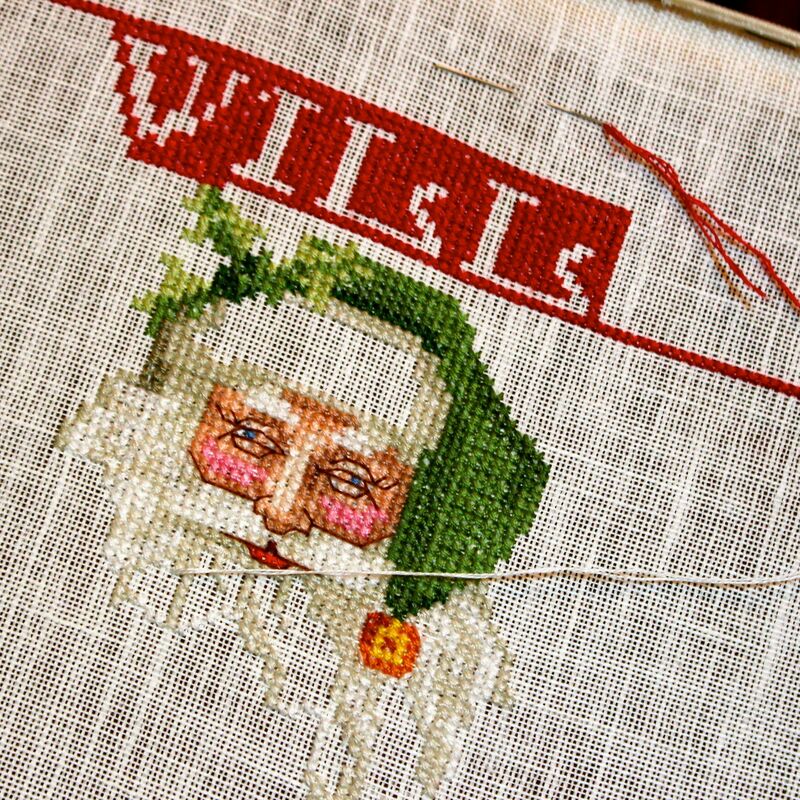 and is currently working on a new stocking for a new grandson. And we have moved from the city to our “camp” full time. 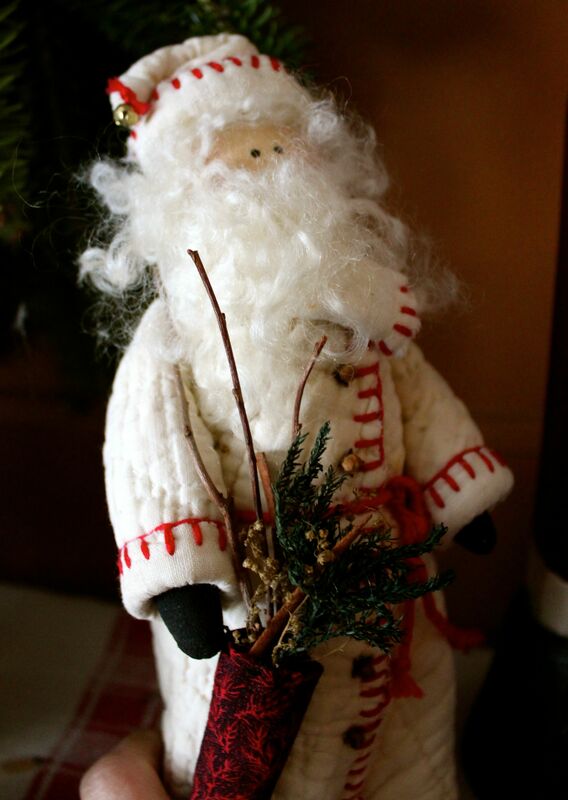 We live in a rustic setting, in the country, and my Santa looks right at home. It seems to me that this is what Christmas is all about. Being in a comfortable place that feels like home, with reminders of how very much one is loved. 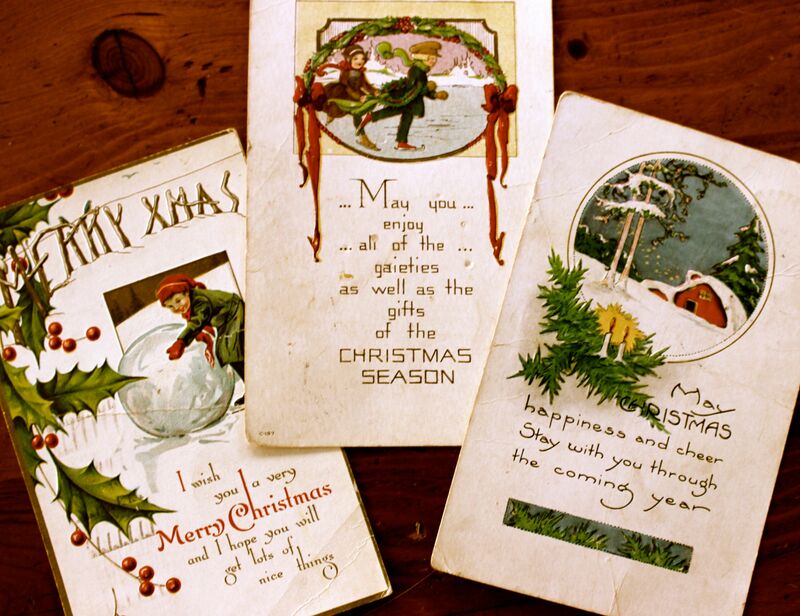 If you celebrate Christmas, is there one ornament or decoration that sums up the meaning of holiday for you? I’d love to hear about it. Yes, Virginia . . .
Reading your blogs has taught me so much. One thing I’ve learned lately is that decorating for Christmas is a passion. I knew this on a theoretical level before but, now, having read about and seen so many of your decorations around the world, I understand it in a much more fundamental way. 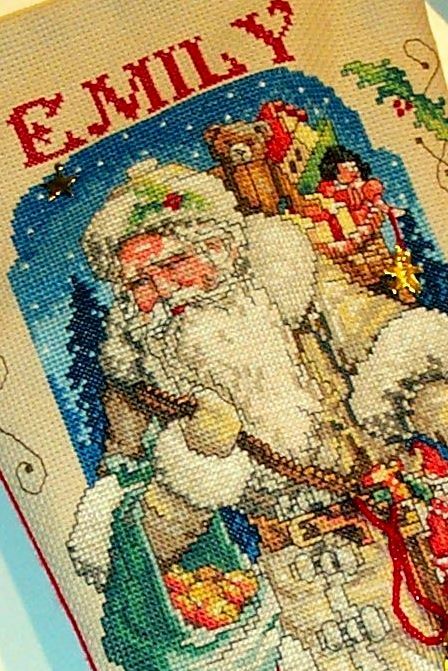 Even those of us who could only be described as cultural Christians—non-religious now but having been brought up in religious homes, with lots of Christmas memories—find joy at this time of year in bringing out the crèches and other Christmas treasures. And, when we decorate, many of us seem to focus around collections of meaningful objects and feature them in our homes. For me, I love Santa. So, even when we don’t do the full-blown decorating of a big tree and the whole house, we always bring out our main collection at Christmas—these Santas that line the mantle. 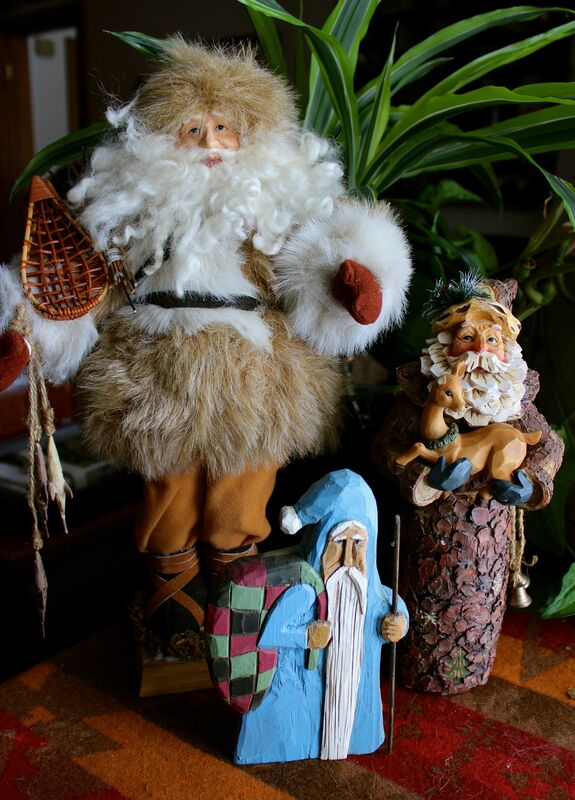 Our Santas have been coming to us for over 20 years and are primarily from the line of Great American Collectibles Old World Santas. These are carved and hand-painted resin figurines, made in the US. 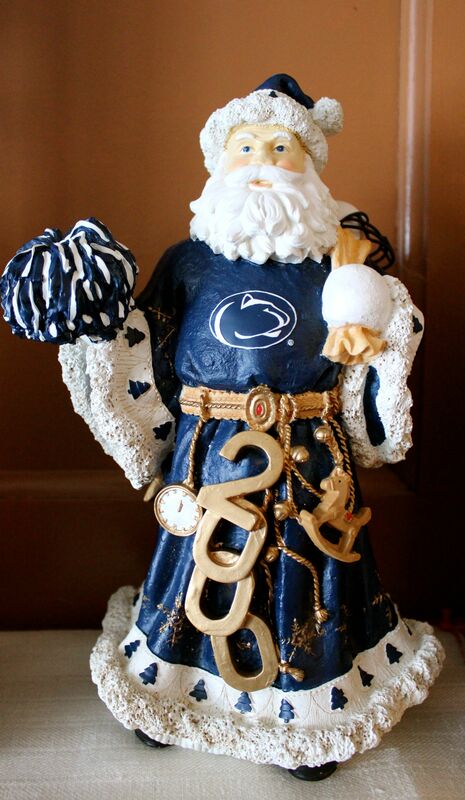 A few new ones are released every year and depict, mostly, folk art-style Santas from around the world. The first one of these Santas that we received Mickey, an Irish Santa given to us by a friend after we went to Ireland on our honeymoon. We liked Mickey’s look so much, we’ve brought many of his brothers home over the years. Many of the Santas have sweet animals with them, which adds enormously to their appeal for us. Some of our Santas come from other places. 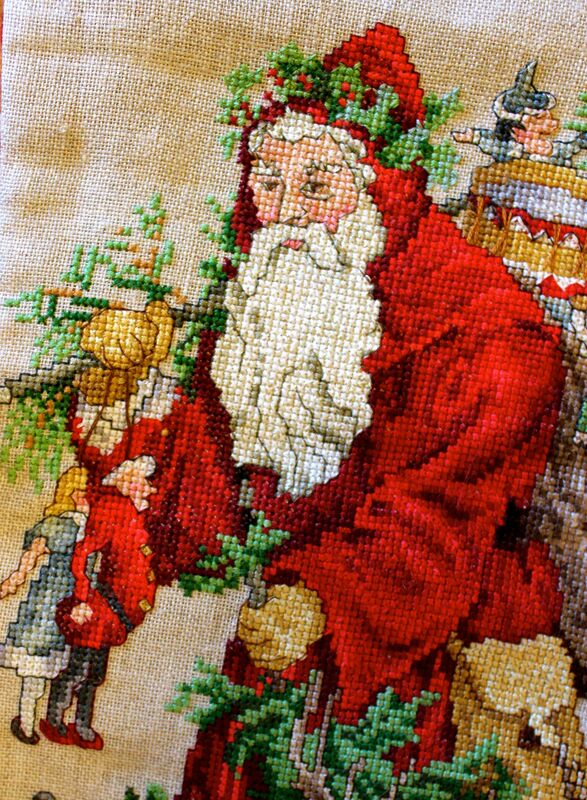 And our Santa from the American Folk Art Museum in New York City. And we have Santas from garage sales! These Santas sleep patiently in storage for most of the year, waiting to come out at Christmas and remind us of all the good that Santa Claus symbolizes—love and generosity and devotion. I believe in Santa! Do you? Since I know many of you are curious, inquisitive, and open to learning wherever you can, I wanted to share this with you. David Yamada, a fellow college prof, has put together this great list of life-long learning opportunities. I have friends who’ve taken courses on Coursera, for one, and they loved them! Take a look and check out David’s blog, Musings of a Gen Joneser–good reading! I’m a lifelong learning junkie, and perhaps you are, too. The world of adult education is somewhat stratified right now: If you want to earn a degree, it will cost you money, maybe a lot of it. On the other hand, if your main objectives involve independent learning, intellectual growth, and personal enrichment, your free and low-cost options are virtually limitless! Let’s start with your public library. A treasure trove awaits, in big cities and small towns alike. Most libraries are now heavily invested in multi-media, offering DVDs and e-books in addition to print materials. Of course, don’t forget “old” (heh) online standbys such as YouTube and Wikipedia. There’s a staggering amount of good stuff on both.